The Hall Tree has become a popular shopping location for many men and women in Natchitoches and surrounding areas due to good old fashion word of mouth. The reason we have such loyal customers is because we promise to only provide our customer with products that make you look and feel fantastic. We put a lot of time into learning our customer’s needs so we can do our best to accommodate their wardrobe & lifestyle. Our store is filled with a diverse selection of men and women’s clothing lines that are fashion forward and modestly priced for any occasion. From formal wear to ultra casual, our large selection and personable staff always provides exceptional customer service and a personalized shopping experience. 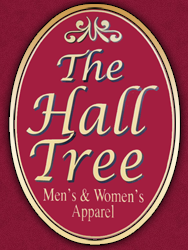 Visit us soon and see the difference for yourself why The Hall Tree is everyone’s first choice for a great selection of quality fashion for men and women’s apparel and accessories. The latest fashions with every type of woman in mind, you’ll find something to fit your unique personal style! Men’s clothing for every occasion, preference, and budget. The Hall Tree will keep you looking your best! We offer the largest inventory of Brighton Jewelry, leather goods & accessories in North Louisiana!